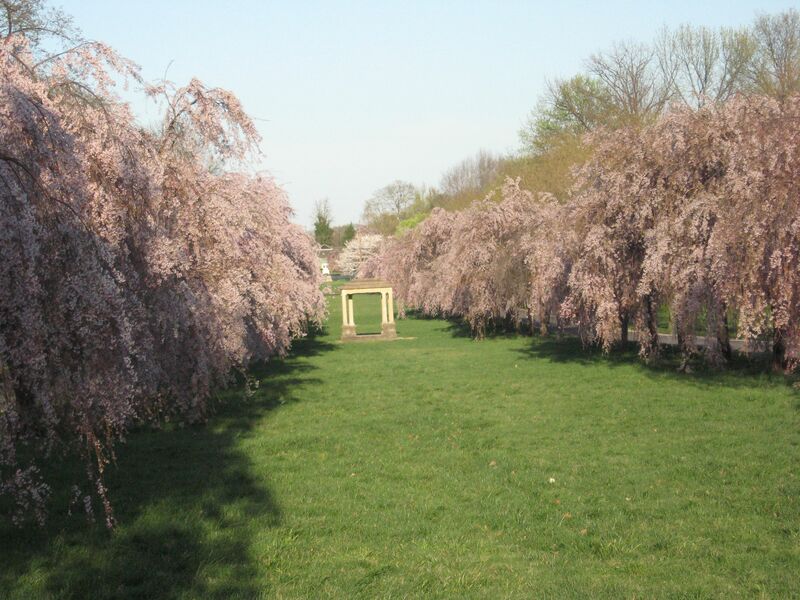 In West Park there is a long row of Cherry trees opposite the Horticultural center, on the west side of Belmont Ave. At the west end of this row is the marble Total Abstinence Fountain. The trees begin blooming at the Fountain, and the blooms move toward Belmont Ave each day during the bloom period. It is easy to miss the day the whole Allee is blooming at the same time. In the middle is a limestone pavilion, a remnant of the Centennial Exposition of 1876, which took place on these grounds. It was great to catch the full blooming of the whole Allee, with a blue sky and a nice evening light. We were walking Keeba and then that time came to try to find the nearest trash receptacle. We were walking towards Belmont Ave and we passed through a few fields to the north, towards the Ohio House, another vestige of the Centennial, which now is the home to the Centennial Cafe. On our way through the fields, we came upon the most astonishing discovery: Drifts of white covering parts of the field. 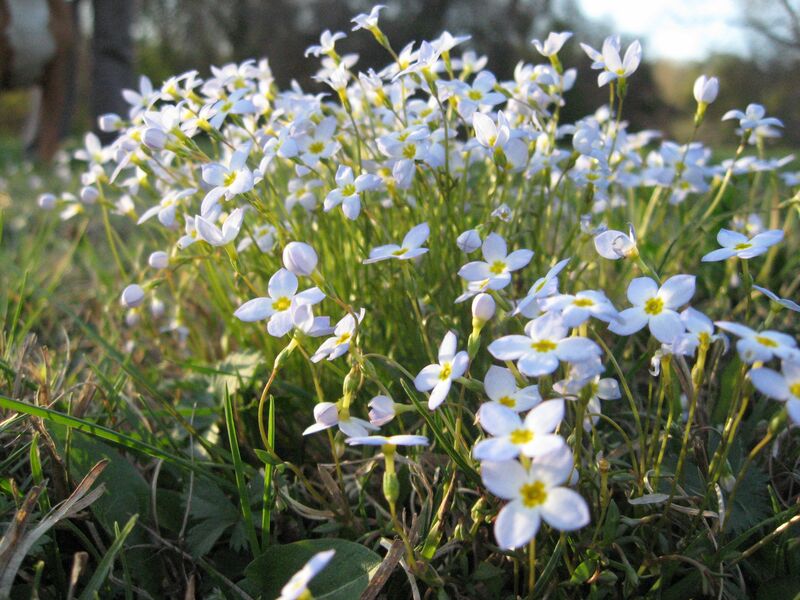 The white flowers really stood out, and upon closer examination, we saw that they were indeed the native wildflower Houstonia caerulea . Also called Quaker Ladies, this flower upon closer inspection has a blueish tint. The colonies are stunning. The flowers are only a half inch across, but when they are en masse, they have a collective display that will satisfy the aspirations of the springtime flower seeker, add curiosity to the casual observer, and provide data for a botanical researcher or student. We are on the aspiring flower seeker spectrum on one end and the data collecting students on the other. We asked ourselves the question, why are they growing here? What are the conditions? Isabelle brought up that they like moss, so we started to look for populations that were associated with moss, and soon enough we found a whole colony growing out of a colony of moss. 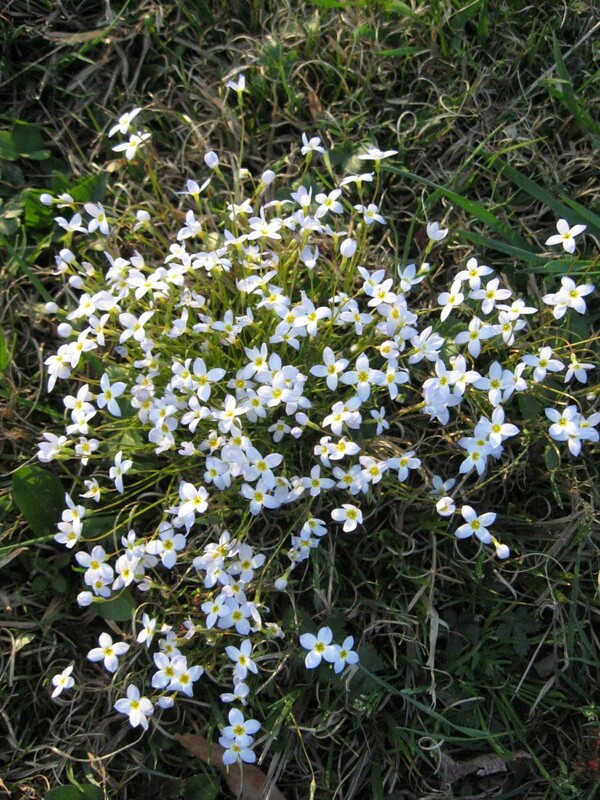 We tried to grow Bluets in our garden, but with no success. They really are specific about their conditions. Our failure made us more curious about why these plants were growing here. There are wetlands nearby. They like moist environments, like moss does. They like some sun too, out in this open field. The field gets mowed all summer long. Hopefully these fabulous native flower colonies will be able to go to seed before they are mowed down. Maybe the mowed environment allows them to thrive. If you like Mayapples, this is the place. 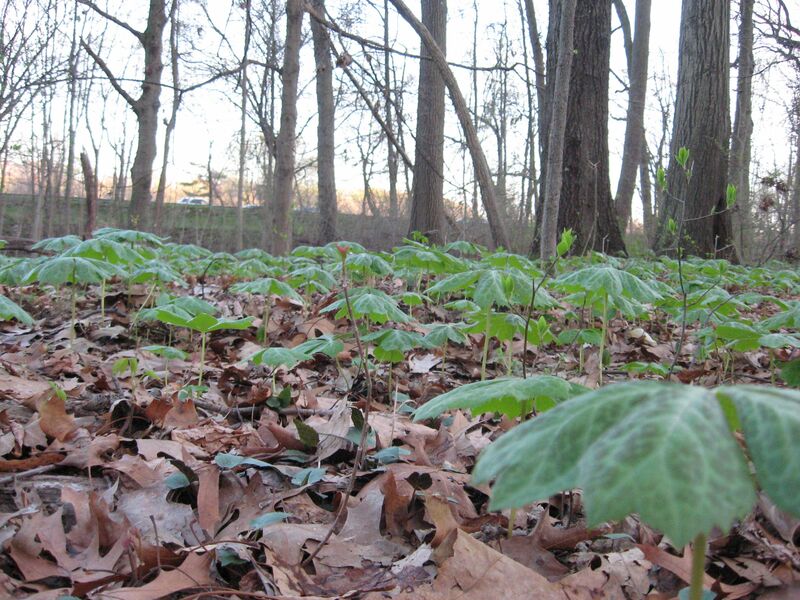 A series of bicycle paths that lead from Belmont Plateau to the Recycling Center reveal a stunning display of Mayapple colonies. 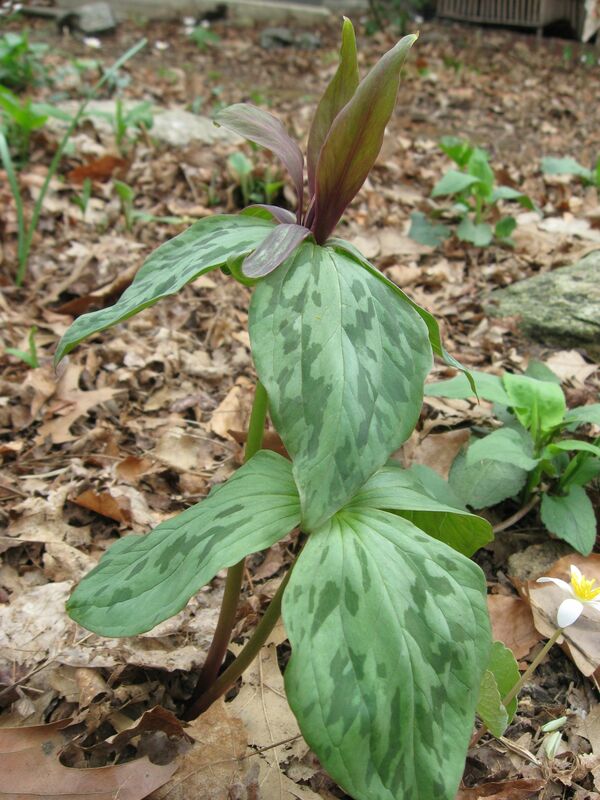 If you look closely, there are also some Trout lilies and Cut Leaved Toothwort as well as an abundance of Spring Beauty. Some of the ravines on this walk have big oaks and Beeches, and still retain that feel of an old forest. The native wildflowers add to the overall effect of a natural area, where one can imagine what it was like to be there hundreds of years ago. In contrast, the plateau areas are full of disturbance and invasives. We find this a typical pattern in the northeastern piedmont region. 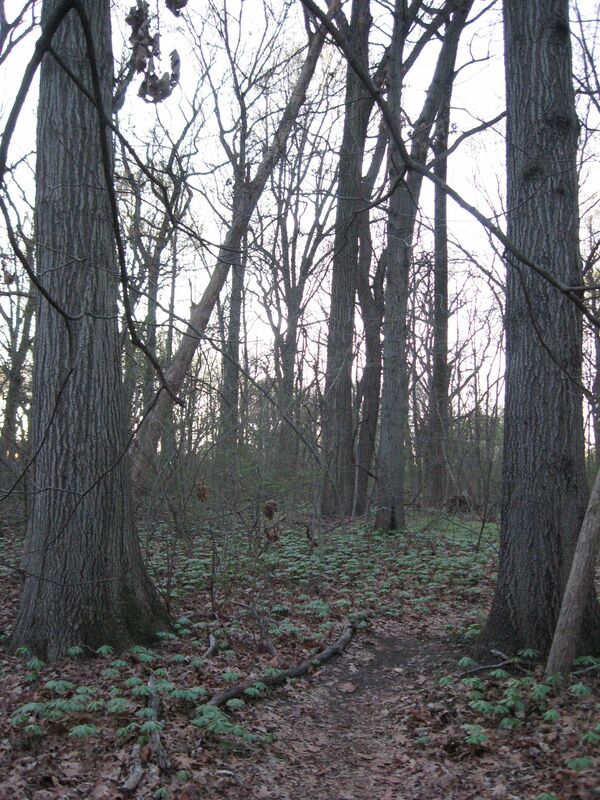 An enchanting evening walk nonetheless, with countless Mayapples gracing the forest floor. 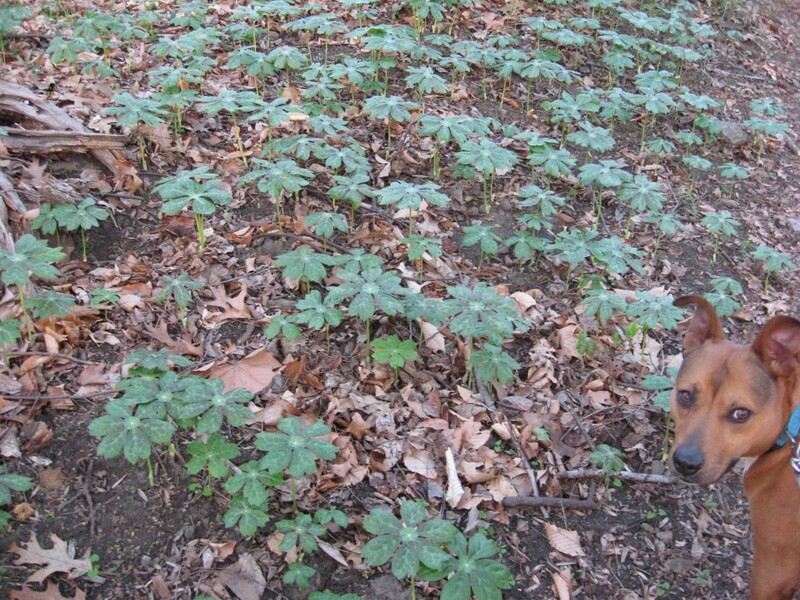 Keeba, making sure that noone accidentally steps on a Mayapple or any other wildflower growing right next to the path. Except for the Schuylkill expressway roaring away in the backround, this pleasant sylvan scene is evocative of an ancient springtime, a place where the natural world we have inherited has evolved, millenia after millenia. Before us is something of a time capsule, a window into the past, living ancients renewing themselves year after year until this very spring before our eyes. 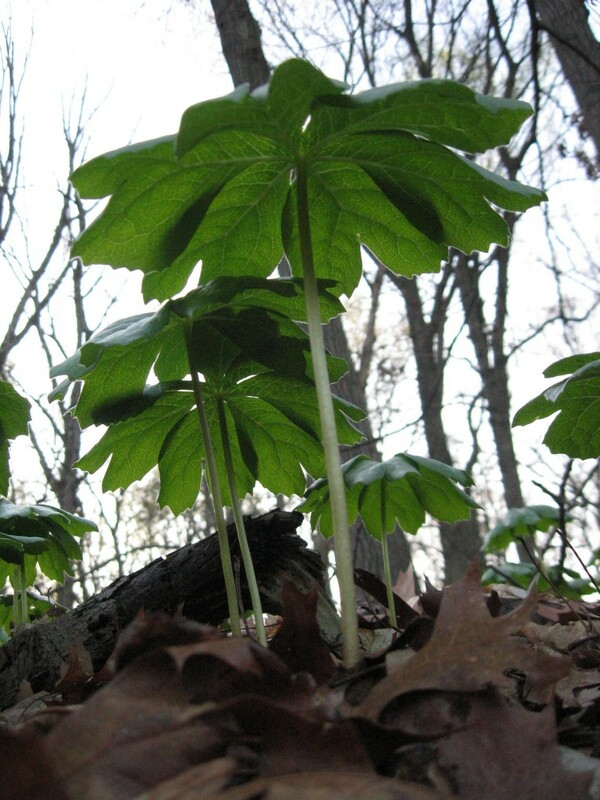 Within the ecosystem of the Mayapple is the Eastern Box turtle, which also emerges from the forest floor, and finds as part of its diet the Mayapple itself, the fruit of the plant Podophyllum peltatum. This fruit provides sustenance for the turtle and in return, the seeds are roughed up in the turtles digestive tract , which will help them germinate after the turtle disperses them. So if you are on the Schuylkill, stuck in a horrible traffic jam, remember you are right next to a beautiful forest where there are all kinds of species interacting, and great old trees and some flowers. But like the Schuylkill, it is not without its problems. The Twinleaf has a very short bloom. We had been keeping a close eye on it everyday, so we did not miss its bloom. 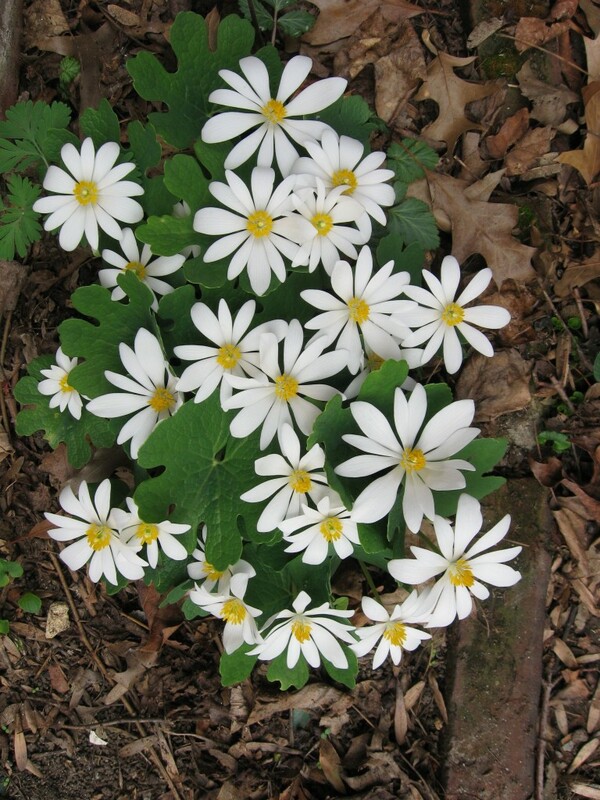 The Twinleaf is similar to the Bloodroot in some respects; the ephemeral flower and the texture of the leaves. The leaves have a distinct butterfly appearance and they are on taller stems. 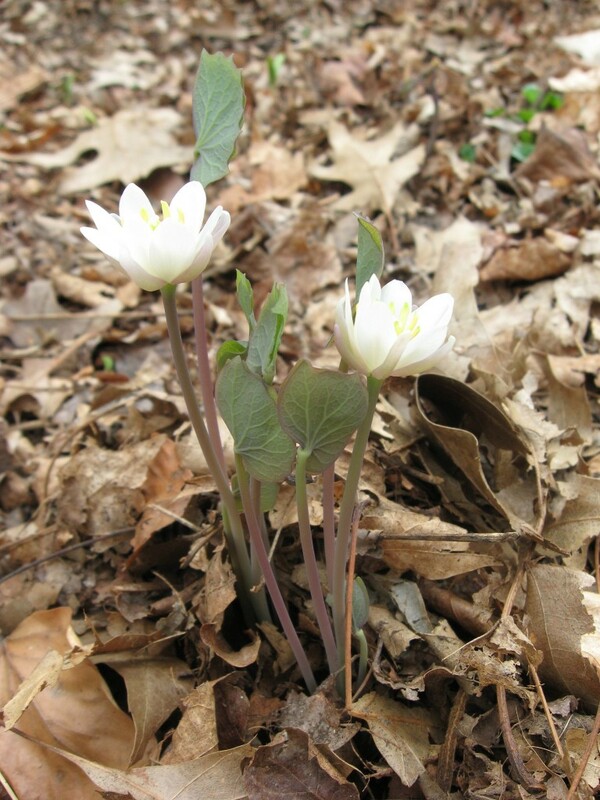 In this picture above, the emerging twinleaf could easily be mistaken for an emerging Bloodroot. 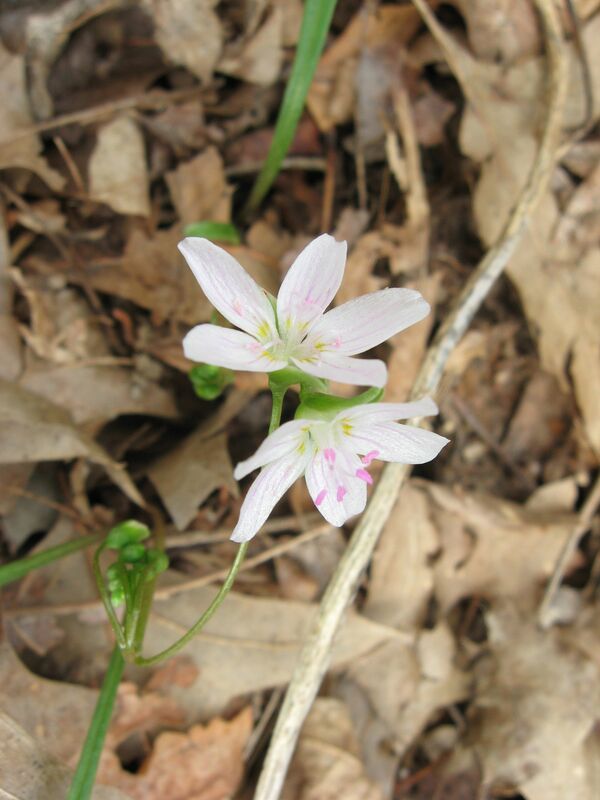 Claytonia Virginica, Above. The Spring Beauty, another great garden specimen. The ephemeral flower lasts one day, but curled up below are the flowers for tomorrow and the day after. 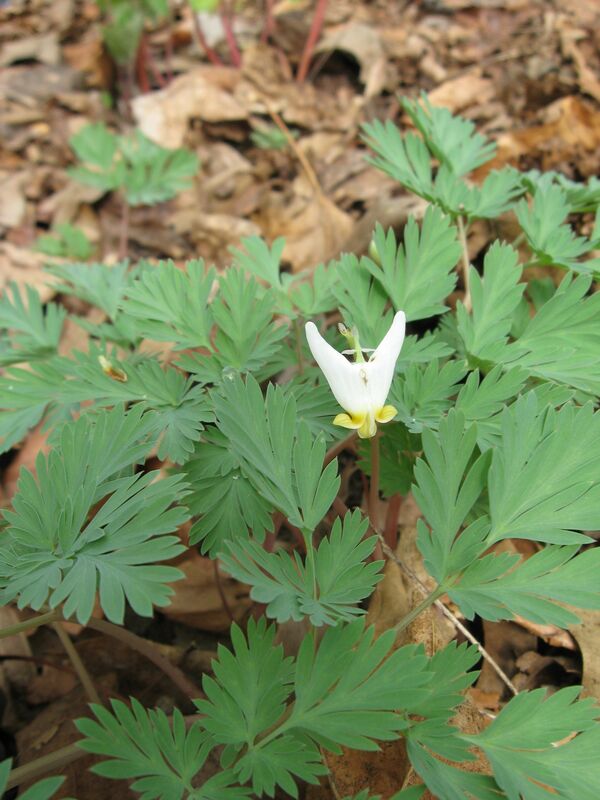 Above, Dicentra cucullaria, the Dutchman’s Breeches, named for the look of pantaloons hung out to dry. When we purchased this from the nursery three years ago we were told it would take a few years to get established and actually flower. This is our first and only flower we have ever had! Our first blooming Rue anenome blooms in the above picture. Above, a yet to be identified sessile Trillium. What was purchased as a white trillium, turned out to be another variety altogether! This is one risk of buying bare root plants from time to time. This one is not native to our region of Pennsylvania, something we aim for in our garden, but we will see how this one does. 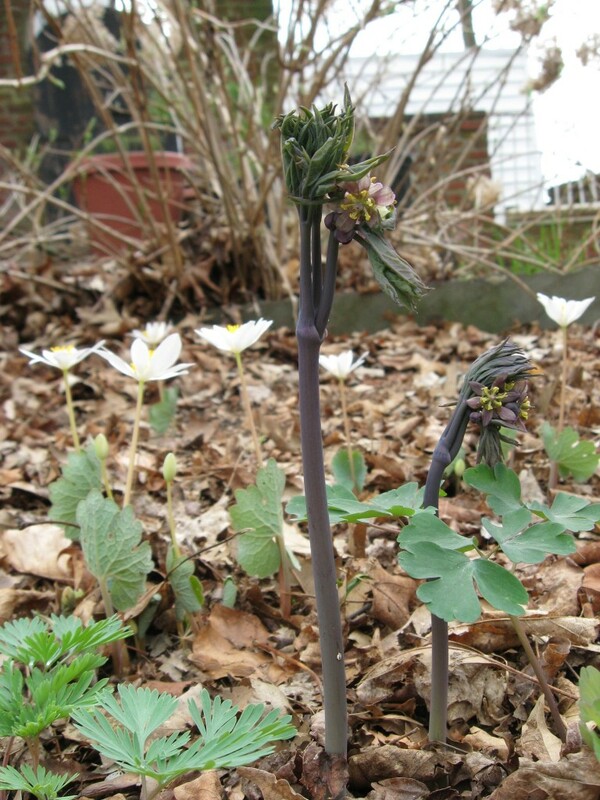 The Blue Cohosh above has alot of personality when it first emerges from the earth. The plant is still curled up, and it is flowering, with a very beautiful, but understated yellow flower. 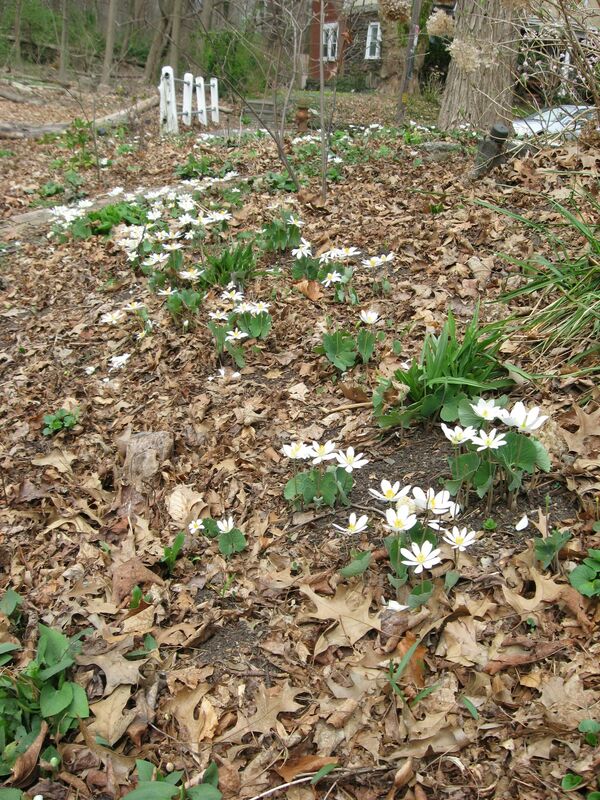 Our Bloodroot plants have been slowly growing into attractive colonies. What began as two bags of root segments purchased in the fall of 2009 is now a yard full of clusters of beautiful white flowers. 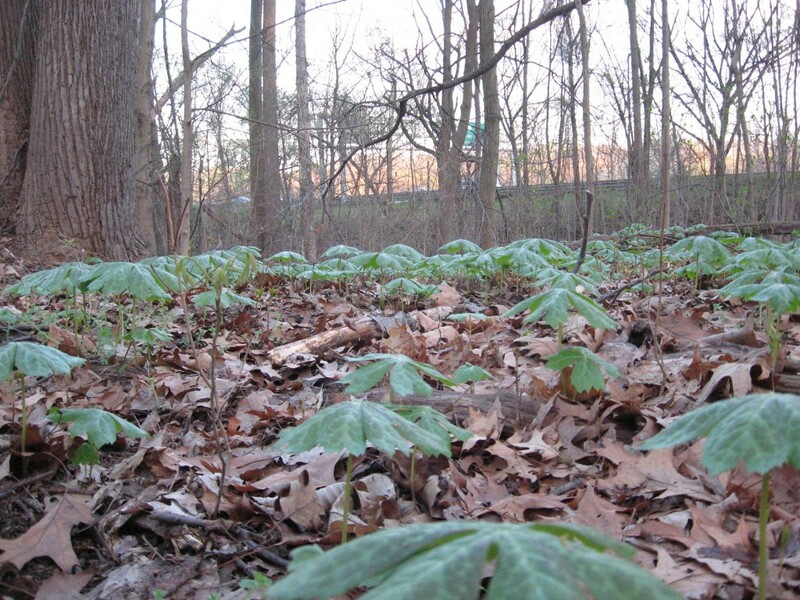 Then the shimmering blue -green leathery leaves will fill out as ground cover. When we first started out, this whole yard was a monolithic strata of Japanese Pachysandra(Pachysandra terminalis), much of which had escaped into the adjacent Morris Park. 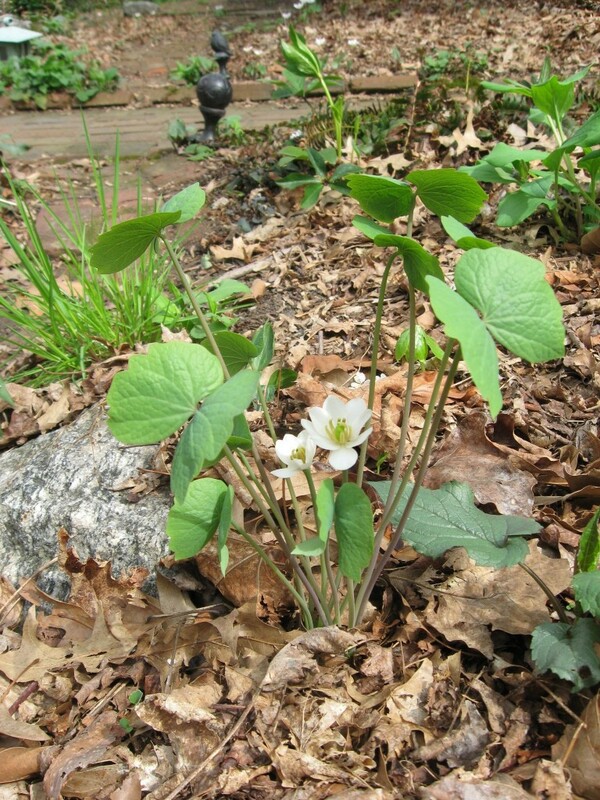 We had a vision of using bloodroot as a groundcover to replace the Pachysandra. 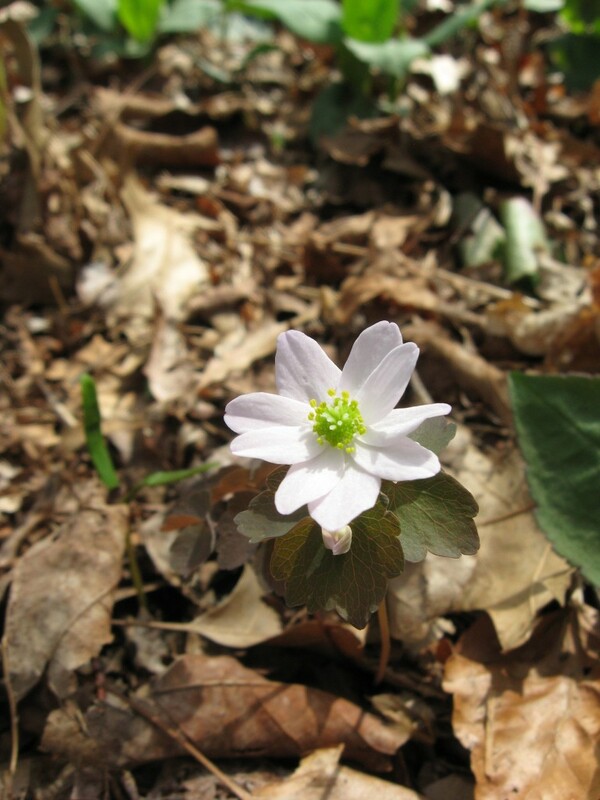 If you have a woodland yard in the Eastern U.S. and are interested in creating a woodland forest floor, many of these plants may be suitable for your site, especially on the piedmont. They are available at native plant nurseries and plant sales in your area, and are a pleasure to grow!